For instance I would like to have these informations e.g. 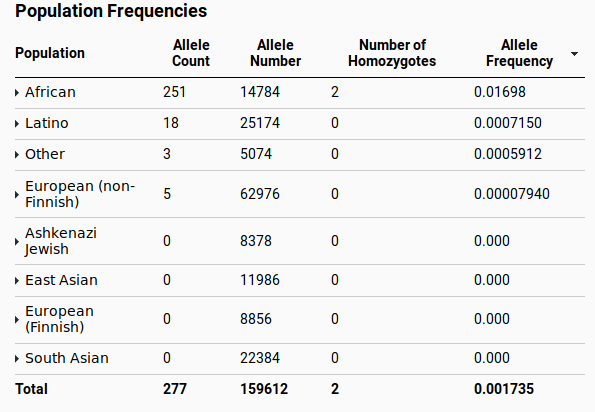 for variant https://gnomad.broadinstitute.org/variant/1-55516888-G-GA . I'm interested in the column "Alle Count" and "Allele number". Not API, but maybe this bioconductor package - MafDb.gnomAD.r2.0.1.GRCh38 ? Or we can always try and scrape the table, maybe see rvest. varsome has an API, it needs a login, and might not be free. Is tabix helpful? get in VCF format and use bcftools to extract fields of interest as tsv. Is this variant probably an artifact?